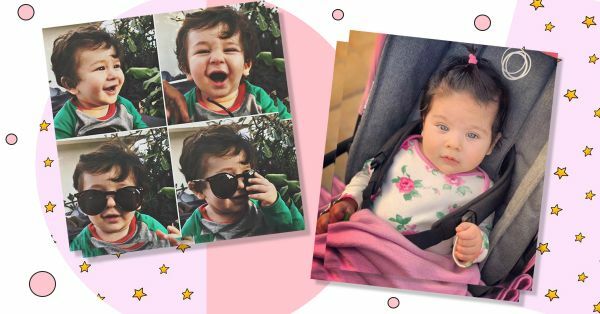 "Oh, Baby" Your Reaction To Taimur And His Contemporaries' Trendy Wardrobes! It’s no news flash that Bollywood’s young ‘uns are the objects of incessant affection across the country. So much so, that their names are actual hashtags being searched on Instagram (and of course, by now you know they have their own fan pages). Even though they’ve just probably started talking, they have more friends than I do (great for a 27-year-old’s self-esteem), I have to say. If you aren’t in love with Kareena Kapoor and Saif Ali Khan’s insta-famous boy wonder yet this outfit will do the job. Not only is Taimur rocking the cutest striped button down with a mickey mouse patch, he is also up to trend in those converse sneakers.OMG, so tiny! Isn’t Mira and Shahid Kapoor’s daughter Misha cute as a button? And what is she up to here? Oh, just a casual stroll with mum in the chicest shirt dress ever, NBD. And I’m not kidding, I’ve been hunting that belt down for months. Of course, she gets her hands on it first. Misha, I think you’re going to grow up to be a fashion icon. Aahil is Bollywood actor Aayush Sharma and Arpita Khan’s precious little boy. Don’t be surprised by how cool the little munchkin looks here. I mean, his wardrobe has some serious game. That graphic tee and denim jogger combination is killer, isn’t it? Athleisure look nailed. How insanely adorable is Imara in this baby pink tulle dress? Perfect for a birthday party in the sun, I’d say, or a fun day picnic-ing with dad. Those polka dots and that smile, could it get any cuter? This little heartbreaker has a stylish future ahead of her, doesn’t she? If you recognise this rough, grunge look, it’s SRK’s signature style… and little Abram is learning fast. The statement trends this kid is pulling off - back print and camo together - I’m impressed. Eagerly awaiting his big Bollywood debut. This much cute in one picture is unfair, really. But Karan Johar’s twins are as stylish as they are adorable. While Roohi, in her baby pink dress, looks like a doe-eyed princess here, Yash works a classic red and blue combination (with different coloured sleeves, might I add). Brava, kiddos. Floral print onesies never looked better, amirite? Peeps, this is Soha Ali Khan and Kunal Khemu’s angelic baby girl, Inaaya. And yes, she is working an all-pink outfit. Millennial babies wear millennial pink, I believe. While Tusshar Kapoor gives them a big grin, his son Lakshya Kapoor doesn’t seem too fond of the Bollywood paps here. On the other hand, I am especially fond of his casual look. A crisp white button down, red joggers and ohhh, those small boat loafers - this baby is ready to sail into the fashion world.